No this isn't a pub review - well it sort of is! But on Saturday I finally got round to visiting the house/pub in which my 6x Great Grandparents lived along with their children (including my 5x Great Grandfather). They were William and Ann Gauler (née Chappell) and they lived in the beautiful Cotswold village of Minchinhampton on the common. 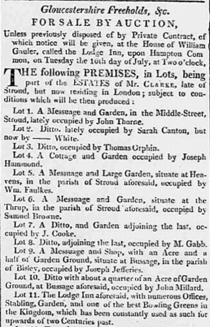 I first found out they lived there from a newspaper article about an auction there in 1811; including the sale of the inn with 'one of the best Bowling Greens in the Kingdom'! It was lot number 11. At the time it was called the Lodge Inn but when a newer lodge was built they were given the inventive names of the New Lodge Inn and the Old Lodge Inn. When a few family members and I got there; we was in awe of how beautiful village Minchinhampton was. When we found the inn on the common (somehow we got lost - even though there is nothing really surrounding it) we finally got to see where they lived! We stepped inside and saw that some of the features which would have still been there back in the time when our ancestors lived there. We bought a drink then sat by the old fire place which was probably there back in circa 1811 while are food was being cooked. We sat and talked (well I did) about William, Ann and their children. It was really nice to sit and talk about them in the place they would have been. Probably why I like going to churches (mainly in the rain!). As we finished our chips, we met a man who knew some information about the pub and had a book on it. He told us that the lodge was built by the first owners using the stone found on the common about 400 years ago! We gave him our phone number, as he didn't have the book on him, for him to call us back on. We finally left the inn, in the dark, and returned home. We decided we will have go back there some time soon and I may have discovered another pub, in which Ann worked in, to go to. I promise I am not an alcoholic! Oh and if anyone is wondering - the food was good and I would recommend it to everyone!